New research on the way air carries moisture confirms that deforestation has a major effect on tropical rainfall. A team from the University of Leeds and the NERC Centre for Ecology & Hydrology found that over large regions of the tropics air that had traveled over a more forested landscape in the preceding few days produced at least twice as much rain as air that had traveled over deforested land. By combining these observations with a future projection of Amazonian deforestation, the researchers estimate up to 21 per cent less rainfall in the dry season across the Amazon basin by 2050. 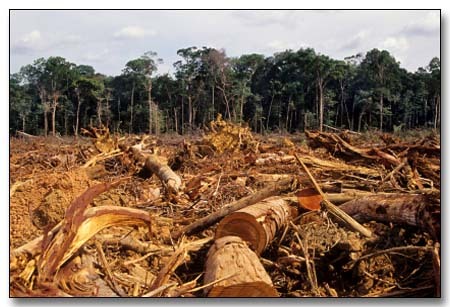 The predicted reduction in rainfall due to deforestation is equivalent to the severe drought in the Amazon in 2010. When forests are replaced by pasture or crops, it can reduce the amount of evapotranspiration (ET) – the recycling of moisture back into the atmosphere by leaves. So the air that has traveled over deforested areas is less humid, which one might expect would lead to lower rainfall. But while there’s plenty of anecdotal evidence that forests increase rainfall, the scientific evidence is not conclusive – does vegetation produce rain or vice versa? This study aimed to demonstrate the link, and understand the reasons behind it. Using newly available satellite data on rainfall patterns and leaf cover, the researchers confirmed a strong positive relationship between the exposure of air masses to vegetation and the rainfall they produce – in other words air that has passed over more forests does rain more. We wanted to explore possible mechanisms behind the correlations we had discovered. So we looked at what had been happening to the air over previous days – where it came from and how much forest it had traveled over. To understand the relationship in detail, the team investigated the journey of air masses arriving over different parts of the forest, to see the cumulative amount of leaf cover the air had moved over during the previous ten days, not just the amount of vegetation it was over when it rained. This showed that the more vegetation the air had traveled over, the more moisture it carried. They also demonstrated that this additional moisture was consistent with additional ET being released from vegetated landscapes – strong evidence that the extra rainfall observed is in fact caused by increased exposure to vegetation. This has important implications for people living and working at the rainforest margins. There isn’t much leaf cover in these regions but it still rains because the air brings moisture from the swathes of rainforest upwind. So deforestation thousands of miles away could interfere with agriculture and industry on the forest margins. Policies aimed at protecting rainforests need to consider their influence on rainfall over a wider area – this research indicates that just retaining forested patches would not be enough to maintain tropical rainfall levels either over or around the rainforests.